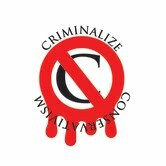 Criminalize Conservatism: Rush Limbaugh: Pigman or Prince of Propaganda? 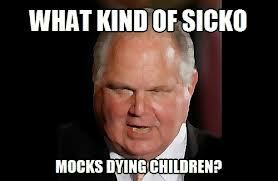 Rush Limbaugh: Pigman or Prince of Propaganda? "Could divorce #4 be on the horizon? "According to a story on Politico, Rush Limbaugh is considering ending his marriage with Cumulus Media at the end of this year. 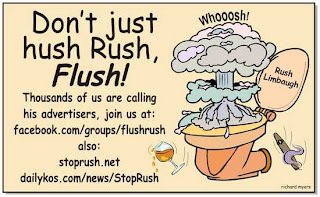 "Cumulus airs the Rush Limbaugh Show on 40 stations across the country--many of them monitored by the Flush Rush Facebook community--including WABC in New York City. "'Clearly, it's been well documented that the talk side has been challenged. Most of that due to some of the issues that happened a year ago and so there has been residual hangover on the talk side in terms of advertisers sitting out and not placing there. "'Clearly that's had an impact not only on our network business [at Cumulus Media Networks], but it's had an impact on some of the news talk stations that we own. "Neither Cumulus nor Clear Channel Media (the latter of whom airs the Rush Limbaugh Show on nearly 600 stations) had any comment about Limbaugh's potential departure. "The truth of the matter is, Rush Limbaugh's schtick has become toxic for talk radio, and he's simply trying to blame everyone around him for the failure of his once successful business model. It's his fault. "It's also worth noting that Cumulus has scheduled a conference call for Tuesday to announce its first quarter earnings. 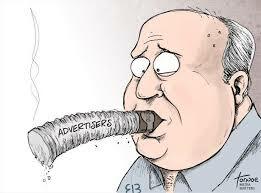 Could Limbaugh's team be trying to get out ahead of a potential decision by Cumulus to cut their losses and flush Rush? "The StopRush movement has been working for more than a year now to hold Rush Limbaugh accountable for the damaging content of his show and has helped convince more than 2,600 advertisers to withdraw their ads. Find out how you can help after the jump. "Decent folks who believe in tolerance and equality are no longer powerless against Limbaugh's efforts to spread intolerance on the radio. StopRush is making a major impact by convincing advertisers on this show to withdraw their ads--and with your help we can do even more. Just a few emails, tweets, or Facebook messages a week to Limbaugh's advertisers can go a long way toward making hatred less profitable. It is our collective voice that makes us strong. 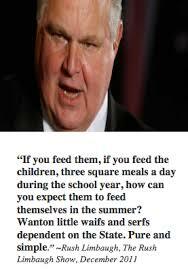 "Want to do something hold Limbaugh accountable? 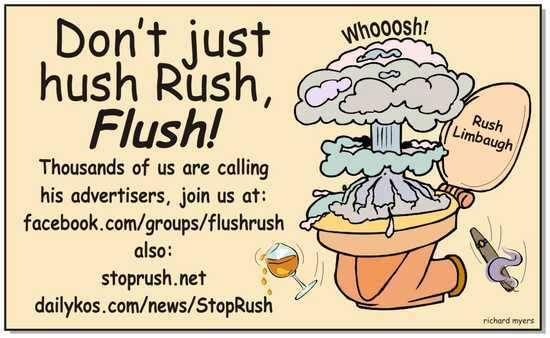 "Install: ThinkContext StopRush browser extension--notifies you as you browse which companies advertise on Rush." 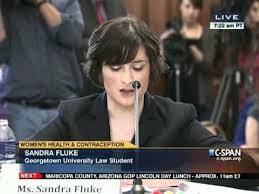 "It's been one year since Rush Limbaugh's invective-filled tirade against then-Georgetown Law student Sandra Fluke. With hundreds of advertisers and millions of dollars lost, the business of right-wing radio is suffering, but Rush Limbaugh continues to act as if it were business as usual, which is why Limbaugh is still bad for business. "On February 29, 2012, Rush Limbaugh initiated a three-day smear campaign against Sandra Fluke, launching 46 personal attacks against her. This moment and Limbaugh's subsequent refusal to apologize for, or even acknowledge, all but two of those attacks put the spotlight on the right-wing talk business model that Limbaugh helped construct. "During the following weeks, headlines tracked in near real-time the names of advertisers exiting Limbaugh's show as pundits and natterers speculated about Limbaugh's future. As so often happens, the buzz faded and the news cycle rolled on. But the consequences didn't fade, they intensified. This is due in large part to scores of independent organizers, like the Flush Rush and the #StopRush community. "Rush Limbaugh's recklessness damaged the radio industry and the business of conservative talk. "When advertisers began fleeing from his program, Limbaugh dismissed the losses as akin to losing a 'couple of French fries' and insisted that 'nobody is losing any money here.' This position seemed less tenable after Limbaugh employed the services of a crisis manager to handle the fallout, and the right-wing talker's protestations were proven false once financial reports started rolling in. "For example, Cumulus Media, a radio company that carries Limbaugh's show in 38 markets, reported millions of dollars in lost revenue and attributed the losses in part to the Limbaugh advertiser fallout. Dial Global, a radio syndication company, reported roughly $100 million in losses for 2012 and publicly cited Limbaugh as a significant contributing factor. "Despite continued rebukes by advertisers, and seemingly without regard for the damage he is causing, Rush Limbaugh adds to the problem by proceeding as if it were business as usual. "Limbaugh has argued that there is 'scholarly research' to support his contention that Mexicans are lazy in comparison to Cubans. "I could go on (and there are plenty more examples), but my point is to illustrate that Limbaugh is just as risky today as he was when he made the Fluke comments. Advertisers don't want to associate with this kind of vitriol, and they know that since Limbaugh hasn't changed, it's only a matter of time before he causes another Fluke-like stir. And they don't want to be on the hook when that happens. 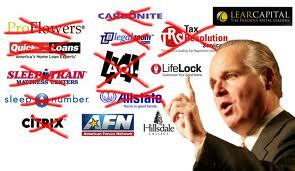 "Rush Limbaugh is still bad for business." "And if we all spread the word about what's really happening in our country, we can regain our traditional, true, family values. "NOTE: THE GREAT LIMBAUGH CON can be ordered from Amazon.com or Barnes&Noble.com., or you can get it directly from the publisher, Fithian Press, by calling 1-800-662-8351. In 1988 when George H. W. Bush was running for President, contested by several self-professed "Conservative" Republicans, a caller asked Limbaugh if he shouldn't support someone other than the obvious moderate in the race, Bush. 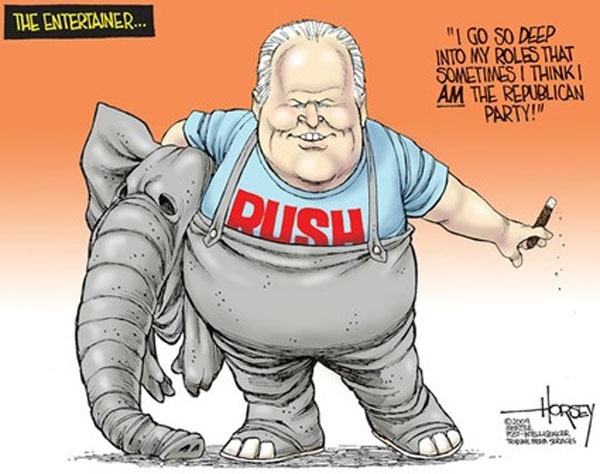 After a long pause, Limbaugh sighed and told the caller that Bush's lack of Conservative credentials might be true, but that he was supporting Bush because he had the best chance to win. 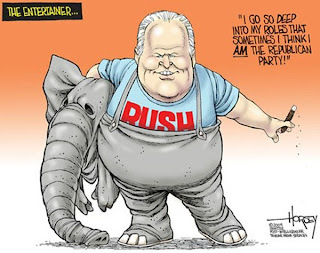 Up to this point, Limbaugh had polished his credentials as a Conservative above party politics, to the point that your neighbor often said, "I don't always agree with him, but sometimes he makes sense." The same neighbor doesn't bother to qualify his opinion any more, he is in complete lockstep with Herr Limbaugh, and proud of it. We'll continue to explore the Limbaugh saga again. propagate ideas which are very often unpopular. And I succeed."